There were so many great pieces and any one of them would grab your attention, but this one by Michael Kehs was pretty astounding. Michael was teaching a course on creativity and developed this piece. While making it he said he was channeling (and texting) Carol Hall as he painted! It turned out to be a great way to broaden his color palate. Michael collaborated with Carol on another project (see below), and if you missed it, here’s a link to a posting on Carol’s demonstration. Doug James started us off with a beautiful Molly, Maple and Mahogany segmented vessel and and an amazing Red Malle burl cap. Gerald Brenner brought in an Apple bowl with a Mahogany center; check out the hand carving around the rim! We love that under-turned lip at the top of the bowl- so easy to handle and a great feel. Inspired by Mike Sorge and some work he’d been doing with square bowls, Scott Malin brought in a few winged vessels for us, including an Ambrosia Maple and Curly Cherry jewelry box with an African Blackwood finial. David Giffen also took away a little something from the Sorge demonstration- TY oil finish, which he used to complete this natural edge end grain turning of Oak. It really highlights the grain! 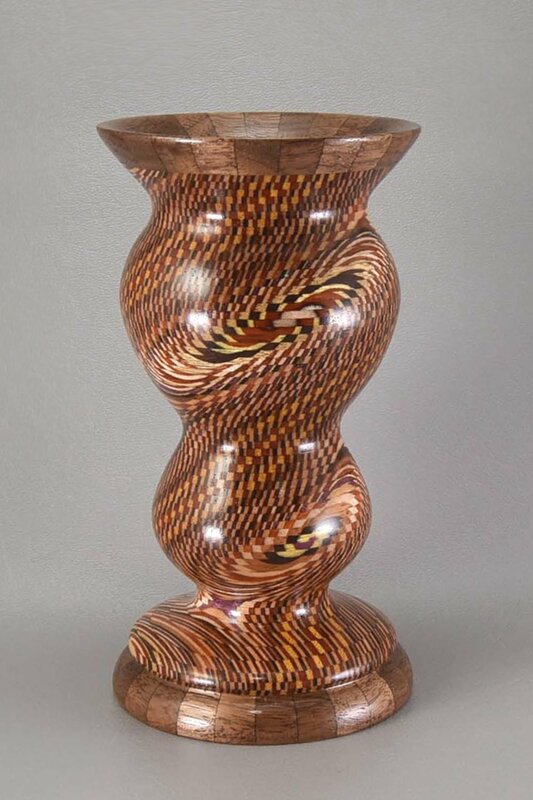 Tangential turning master, Linford Sine brought along this impressive Mahogany and Sumac 16 inch diameter vessel. Linford gets his shine from 3 coats of Danish Oil. Bruce Quigley is like a magician, always surprising us with something a little unexpected. 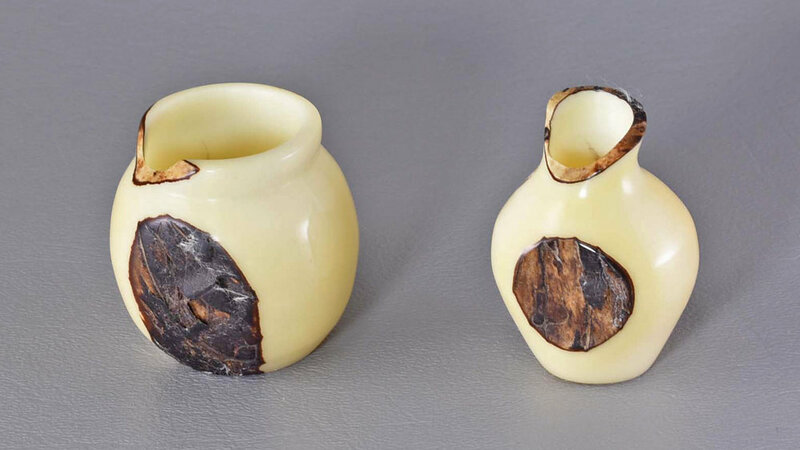 This time it was Tagua nut turnings, and they were quite exquisite. Look how he has used the natural edge against the lustrous alabaster form. Bruce shared that he bought his Tagua from Amazon and used CA glue to attach the nut to a waste block. But wait, those went flying, so he switched to hot melt glue. Bob Crowe was up next with a couple of bowls and a trick of his own. A master bowl turner, Bob showed an Ash bowl with a Bush Oil finish and a Walnut bowl with a Waterlox finish. What caught everyone’s attention was his wooden puzzle- easy to take apart, but hard to reassemble. It’s always Christmas when Tom Gall is around. He’s getting gifts from Bud Hohlfeld (more on that later) and there’s usually an ornament or two hanging around. He’s really gotten the jump on Christmas this year- he usually makes 7 or eight of these beauties each year as gifts. The eight panels are decorated with metallic and iridescent paint and are topped (and bottomed) with painted Holly finials. Tom also brought a vessel that he textured with modeling paste and a toothbrush. After a light sanding, he airbrushed it with two colors, applied at an angle, so that it takes on two colors when viewed from different positions. That is a metallic bronze paint on the top rim and bottom. Ron Durr also presented, as usual for Ron it was a tour de force of variety and craftsmanship. 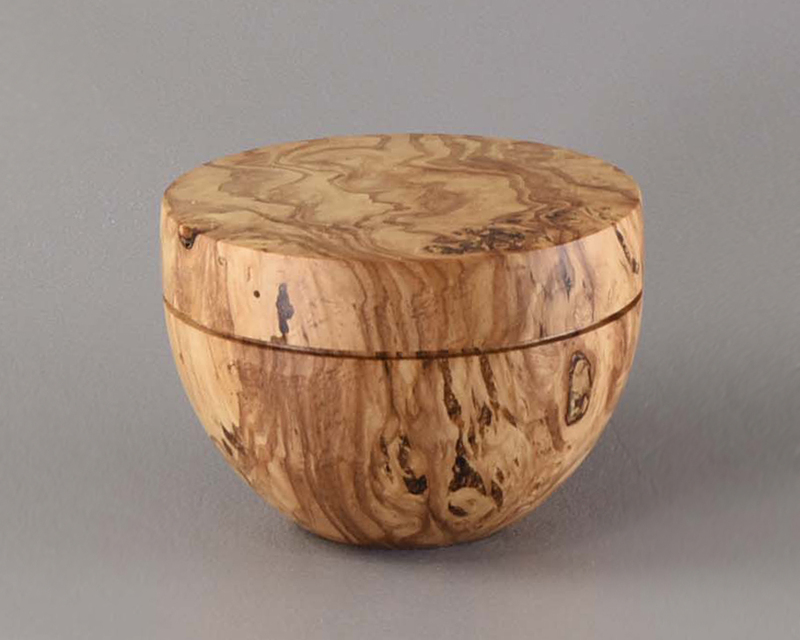 His first piece was a study in a threaded top- not wooden threads, but brass threads on a Elm and Walnut vessel. His next piece was a cherry vessel fitted with a ring to hold a glass insert. Most of Ron’s customers want his vessels to hold water, and he accommodates! His next piece was from a one hundred year old Yew- check out the stunning grain in this piece. From there, Ron moved on to three finialed boxes: English Walnut, Box Elder, and Ambrosia Maple dyed purple. Ron’s use of automotive finish makes the box and finial really shine. 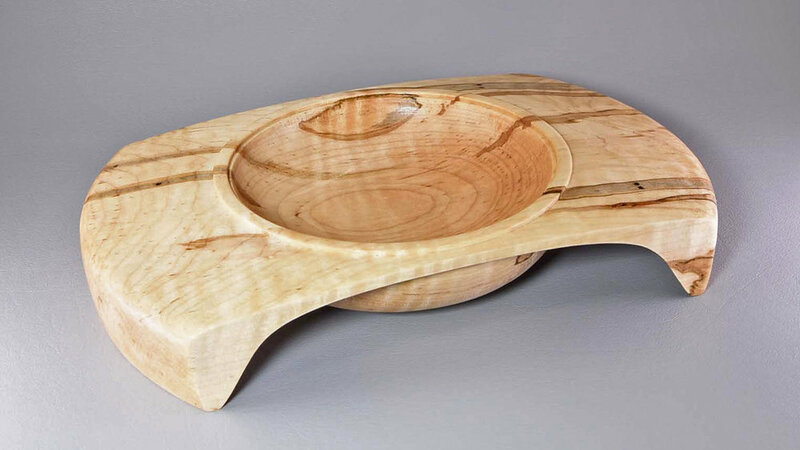 Ron finished up his show with a Cherry heart bowl, a nod to Mike Sorge, and a natural edge Cherry crotch bowl. Quite a show, thanks Ron! Prepare to get dizzy with some astounding numbers and eye-dazzling dizzy bowls. 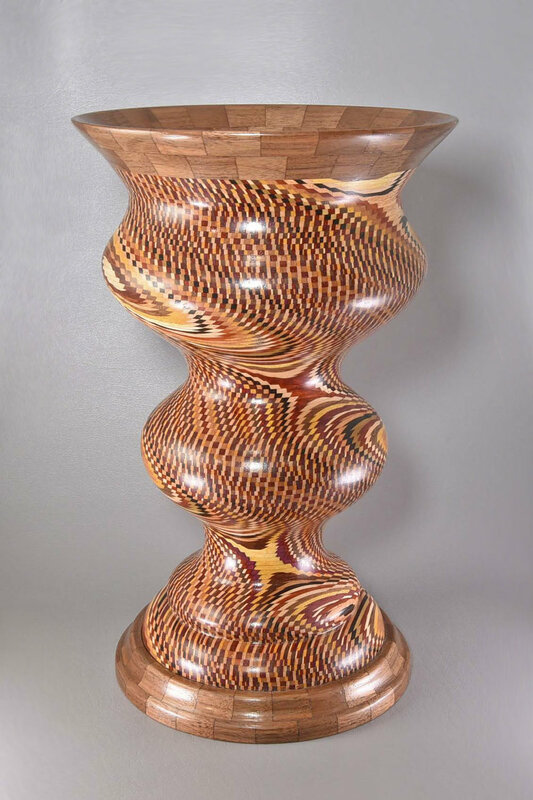 This large dizzy bowl is 24 inches tall and has 230 laminated discs, with 149 wood strips per layer and 60,000 pieces! John Manura is the monster of segmented vessels! 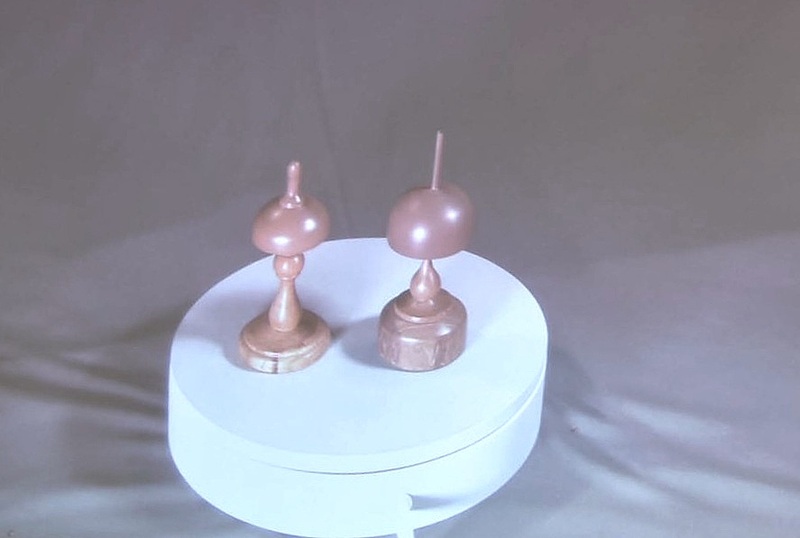 You can see how John makes these unique pieces using his invention, the Accu-Slice, by following this link. His egg serves as a cookie dish and has about 30,000 pieces. His last bowl is made from the scraps of other projects and has 115 layers and about 30,000 pieces too. John uses Bush Oil and polyurethane to finish his work. You can see where John will be showing his Accu-Slice tool at the bottom of his home page: http://www.accu-slice.com/ . Among her many hobbies, Nancy Rourke collects dolls. She recently took on the task of making centerpieces for her club’s annual meeting. These clever hat stands sport souvenir hats for the members- pretty lucky members! You might remember Nancy’s experimentation with turned whistles, well she’s playing around some more, this time with tower tops. These are pretty cool- the top stays on the cup after it has finished spinning! Nancy has been experimenting with the design to make them spin faster. Then, just to round things out, here are a couple of Pine pendant necklaces. What a great use for wood with such beautiful figure. Brian Maguire has been turning for only a year, but look at how far he’s come! He brought along four recent turnings of Sycamore that show great form and highlight both the grain of Sycamore and the interesting decay. 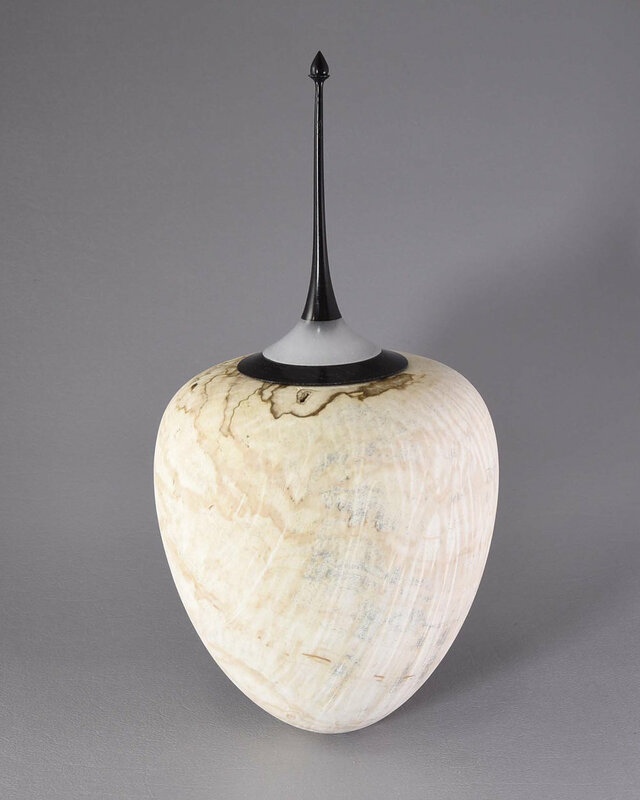 Remember last month’s demonstration (if not, see the next Bucks Blog) where Bud Hohlfeld showed us how he made a hollow form? True to his word, he was back with the finished pieces, and they are pretty special! How lucky was Tom Gall to win one of them in the raffle! The first is an English Walnut and Cocobolo and the second is Spalted Tiger Maple Burl with an African Blackwood and resin (pearlescent powder mixed with Alumilite) finial. 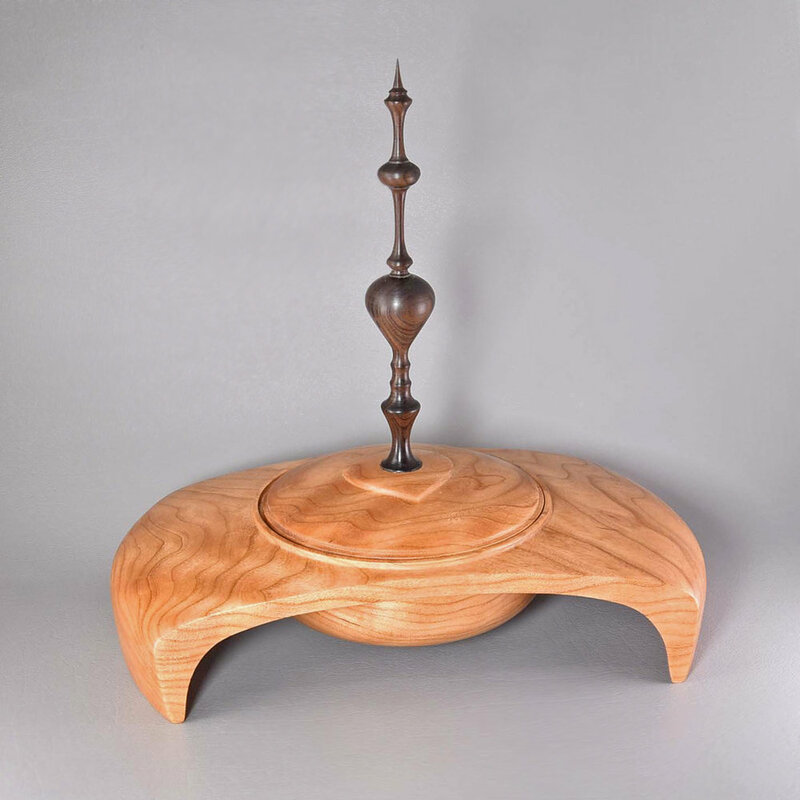 David Schied showed off his skills at making a fine finial with this Maple Box. David let us in on a secret- he made it as a gift for his wife. Well done! An old friend to many of us, but new to the club, Dan Zobel brought in four outstanding vessels. Dan has been working with rotary tools and airbrushing at different angles, much like Tom Gall. His use of texture and color has resulted in some very dynamic and graphic pieces. The wood- Dan said “treewood”. Ryan Lazaar was back with all sorts of interesting pieces, including some handles on rasps, including Cherry and Osage Orange, a hammer and ax! He also made a bottle opener for his Dad. Andy DiPietro showed his latest sculpture, named Mountain View, inspired by the Rocky Mountains. Andy works with an Arbortech and various sanding discs to create the hills and valleys. No easy feat, he has to shape the wood while it is wet so it won’t crack. The danger of cracking goes away only when the piece is sufficiently thin. Click on the pictures for a closer look. Jim Ruocco brought in a couple of pretty big turnings of Apple wood, including a bowl and a wall hanging. Check out the movement in the wall hanging. Jim pointed out the slot he created for its hanging. 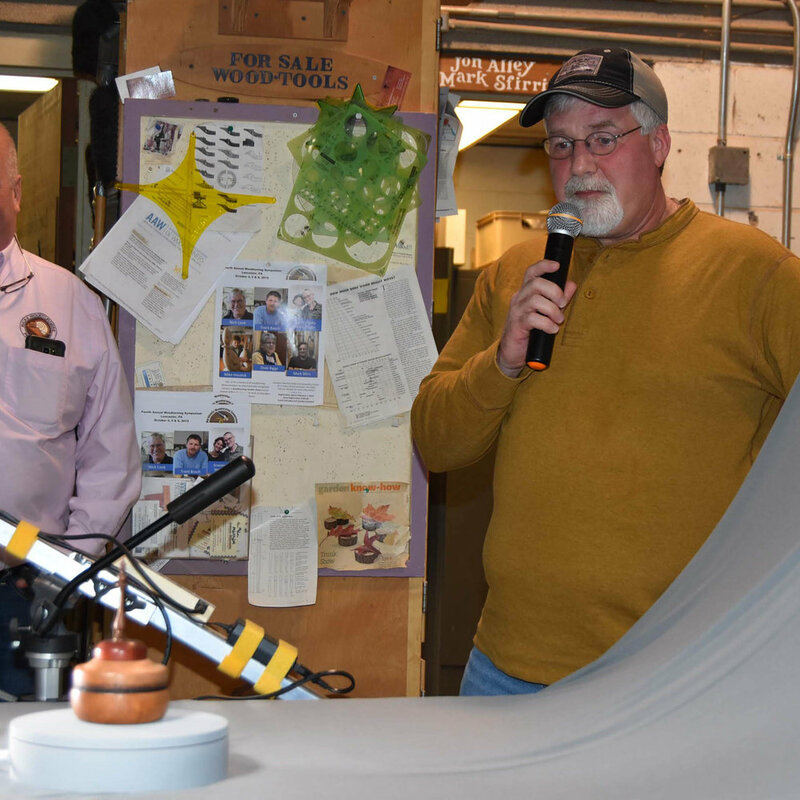 Joe Seltzer has been organizing a collaboration focused on rough turnings made by Ray Key, a big proponent of turning in the UK. 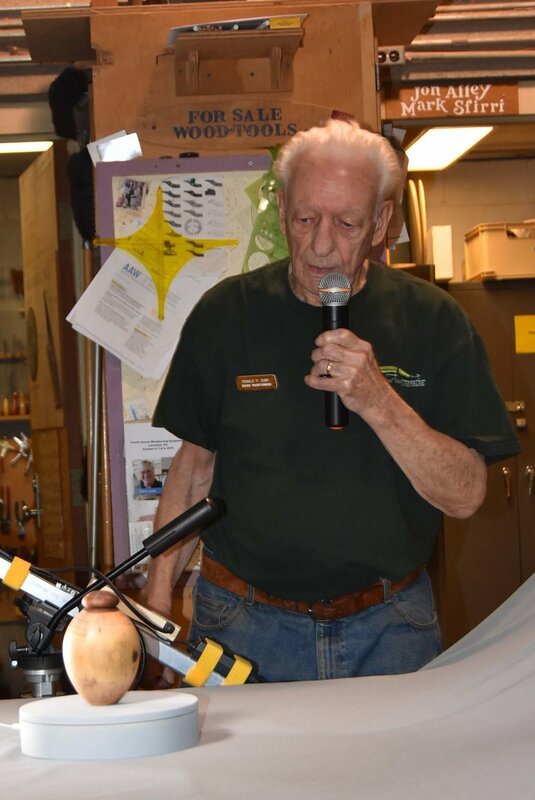 As Joe explained it to us, Ray passed away last year and to honor him The Association of Woodturners of Great Britain is planning an exhibit of pieces first turned by Ray and then finished by about 110 artists from around the world. They include David Ellsworth, Christian Burchard, John Jordan, Rolly Munro, Al Stirt, Benoit Averly, Curt Theobald, Stephen Hogbin, Stuart Batty, Pascal Oudet, Jacques Vesery, Marilyn Campbell, Cindy Drozda, Mike Mahoney, Cynthia Gibson, Nick Agar, Graeme Priddle, Neil Turner, Liam O'Neill, Mike Hosaluk, Art Liesman, Betty Scarpino, Merryll Saylan, Hans Weisflog, Jean-Francois Escoulen, Richard Raffan, and Mark Sfirri. After the exhibition the pieces will be auctioned off and the proceeds will be used for scholarships and to provide for Ray’s wife. After Joe told the organizers about collaborations he had been involved in, he was given 5 pieces to complete through collaboration. 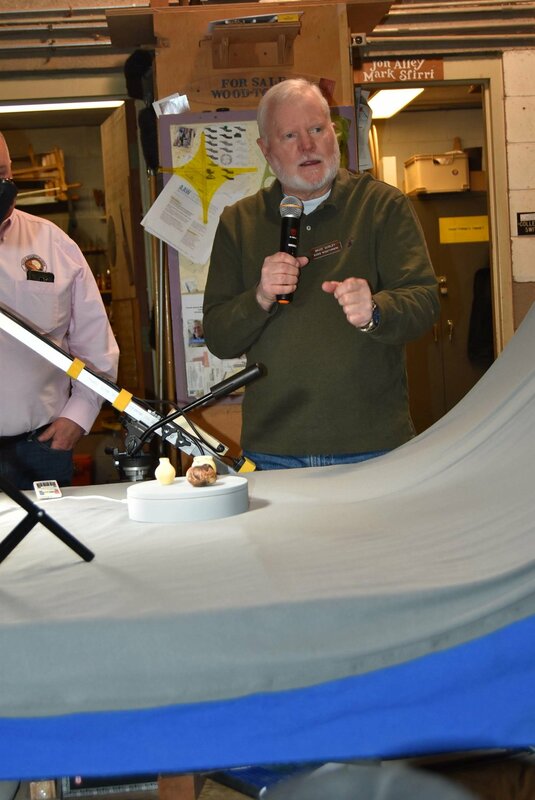 Joe was kind enough to share those results at the Show and Tell. But first he showed us several pieces from his collection that were made by Ray. Click on any one to see a larger image and the woods Ray used. The loose ground rules for the collaborations were to leave some of the Ray Key look and design to the piece. Here’s what resulted.